My So- Called Handmade Life: Progress! I've been avoiding things again, things like posting here. It's not because I've grown tired of it. I'm just not getting a lot of crafting time lately, so I'm using all my spare time to finish up my works in progress. These are for both the Summer Sweater KAL and Classic Must Knits KAL because it doesn't get any more sweater-y or classic than Hannah Fettig's Featherweight and Cirilia Rose's Aidez. So here's a quick instagram update of my Featherweight Cardigan knit in Tosh lace and JaggerSpun Zephyr. I'm thinking I'll do one more green and yellow repeat then finish off the bottom with an extra amount of blue. I'll do the same with the sleeves. Then the band will be knit in the same blue. Honestly, I'm dreading the sleeves. But, I have gotten to a point where I can read while knitting this, carefully and in English style, by feel alone. So, it doesn't seem as time consuming. Of course, with all long stockinette projects comes the promise of a good read or netflix marathon. This time it was seeing Amy and Rory off of Dr. Who. (Am I the only person who was tired of Amy?) and catching up on Clara episodes before the debut of the new doctor. More importantly I re-read Red Mars to get ready for starting Green Mars, finally. Red Mars is one of those books I read as if it's a fact. I just accept it like it happened. I forget I'm reading fiction. Anyway, all of those Martian landscape descriptions make me long for Utah. My Aidez is taking much more concentration than Featherweight. Thankfully, Allyson's chart from The Sweatshop of Love's Aidez KAL a couple of years ago is taking all of the thinking out of this for me. That's a good thing right now. I'm getting used to a new schedule with my son's high school activities and grandparent's routine. My mental hard drive is totally full. On a side note, this acrylic is not getting on my nerves at all. I am a big bargain yarn kind of girl, but even so, I wondered if I'd enjoy it. The answer is yes. That doesn't look like much progress, huh? But it is all knit at once to avoid seams. 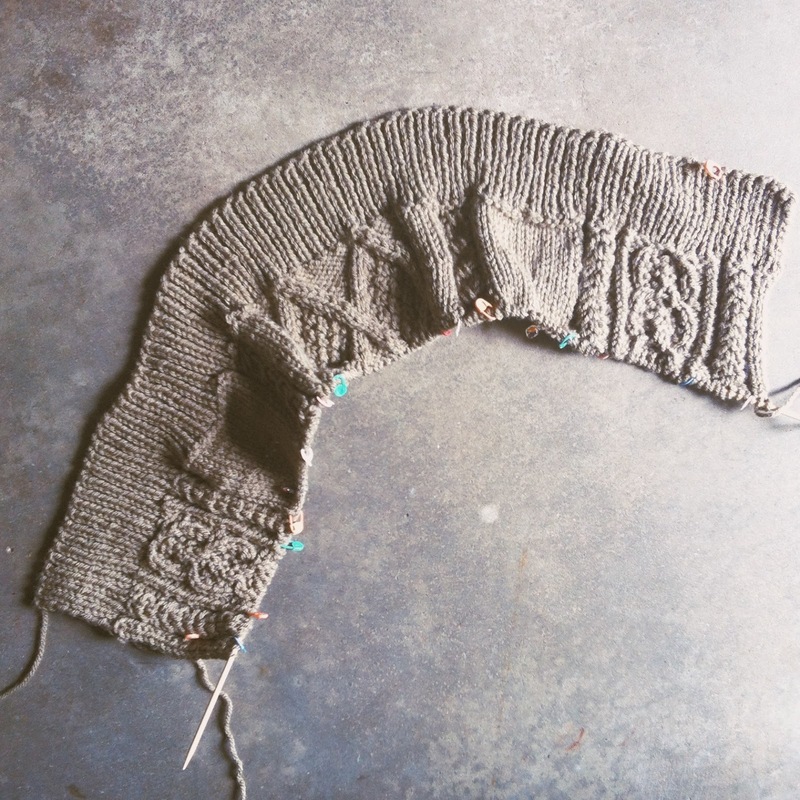 I look at other Aidez projects in my two knitalongs and shudder at all of the curling, cabled shapes, laid out on the floor like puzzle pieces, awaiting the tapestry needle. Right now, seamless and brainless is the way to go for me. Your featherweight cardigan is going to be stunning when you are done. I love your colour choices. Thanks so much, Christine! I considered my colors for days on this one. I was going off what I saw online and, you know, that doesn't always work, but they came and looked just like I'd hoped. 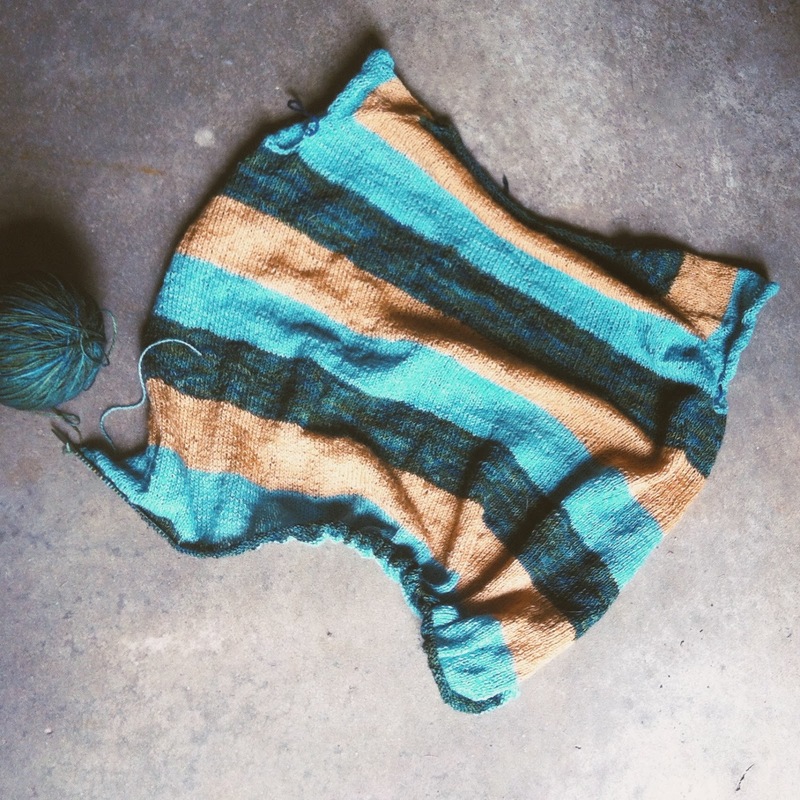 When I started knitting it, I worried that the airiness wouldn't work with the striping, but whatever. I like it and when it's worn it doesn't seem so airy. I was wondering if you'd choose to make the Aidez seamless. I really love the colour you chose - seriously, you have good colour sense. Like the featherweight above. Lovely colour choices! Dr. Who is the best for working those long stretches of boring knitting (or any knitting really). No, you are not the only one who was getting sick of Amy and Rory, so glad for the impossible girl to come in to the picture. Your featherweight is really looking great! You're tempting me to make another for spring. I'm so glad you're enjoying the bulky brava for aidez - isn't it amazing how soft it is? I'm pretty envious you went seamless... I spent a good chunk of time seaming the sides & back of mine Sunday. I suppose a silver lining is practice with mattress stitch? Ha, so glad to hear I'm not alone on the Amy/ Rory issue. I really like the new Dr and his relationship to Clara. I get bored with the whole everything and everyone must be younger attitude of television. I remember my daughter loaned a tv series to a friend, but she wouldn't watch it because there was no one "cute" on it. Thank you, Jennifer. It is crawling along. I'm so grateful you posted about your Aidez in Brava so long ago. It was always in the back of my mind, so it's good to finally do one, and for so little $. It's good that I chose seamless because I don't know that I have the patience for seaming right now, and I might have put it on hold further if I'd had to seam it. As it is, I'm waiting to finish Featherweight, then I'll get back to it.